B for Bag looks at some of the most popular baby diaper bag brands on the market. The following comparison table lists the main diaper bag brands in alphabetical order. Just click on the brand name for more information about the particular brand. The description offers short description to help you to evaluate if this diaper bag brand could be the right one for you or not. The target indicates the target markets that this brand appeals to, e.g. women, men or both sexes. The budget indicates the price range you can expect to pay for this particular brand, allowing you to compare the price of the different baby diaper bag brands. To make the price comparison easier there are three price categories. The price range shown is the one that most bags from this particular brand fall within, i.e. some bags may fall in the price range below (-) or above (+). The price range indicates if the relevant diaper bag brand is low, medium, or high-end price wise. Baby Sherpa target market is active families, which means they offer versatile high-tech diaper backpacks. Baby Sherpa backpacks are safety tested and consumer compliant, i.e. non-toxic, PVC and lead free. Baby Sherpa backpacks are full of practical storage space. There is cooler to keep food and beverage at the right temperature, insulated bottle holder, and generous storage space with various secure compartments. They haven't forgotten the parents needs either. Baby Sherpa backpacks come with ergonomically designed padded shoulder straps and include various accessory pouches for the parents stuff, like keys, sunglasses, cell phone and some types include space for laptop. As they say, Baby Sherpa diaper bags are perfect for the extreme sport of parenting. California Innovations specializes in soft-sided insulated products and now they offer baby diaper bags as well. California Innovations diaper bags are highly functional, with plenty of dedicated space for all the necessities. The look is traditional, making them suitable for both parents. Seriously light and versatile, California Innovations Diaper Bags are designed for modern families on the go. DadGear diaper bags are designed by dads for dads. We all know that men like gear and so do the founders of DadGear. This diaper bag fulfills the baby's needs as well as the dads. DadGear baby diaper bags come in different styles. There are backpacks, messengers, and totes. There are traditional looking bags, as well as highly cool and trendy bags… because not all dads are the same. 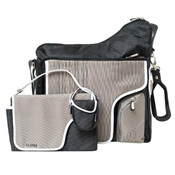 DadGear Diaper Bags are designed with quality, style, and superior function in mind. Dads love them, and mom love that they love them. 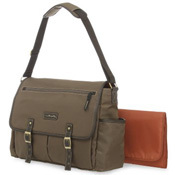 Eddie Bauer diaper bags and accessories are designed with the baby comfort in mind. The diaper bag range includes messengers, totes and backpacks. Most of the designs are suitable for both parents and include everything you expect to find in a baby diaper bag, like removable changing pads, bottle pockets, wet / dry pouches, etc. 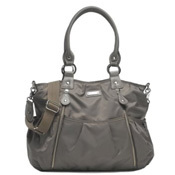 Eddie Bauer Diaper Bags are good looking affordable functional unisex baby diaper bags. J J Cole diaper bags and accessories are designed to fit the lifestyle of busy modern parents. This is why functionality and organization play important role in the bag design, as well as look and feel. And the price is good too. Functional and stylish looking, J J Cole Diaper Bags are the ideal bags for young parents of any age. Kate Spade designer bags and accessories are known for graphic prints, crisp color, and playful sophistication. Their designer diaper bag collection is no exception. Kate Spade diaper bags are stylish and discreet bags that you can everywhere. They are practical for a casual day out, stylish enough for occasions that are more formal. 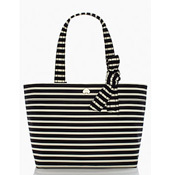 Kate Spade Diaper Bag is the ideal bag for moms that want stylish designer bag that is also a diaper bag. Mia Bossi designer diaper bags combine motherhood and fashion. Highly functional, with everything you need in a diaper bag. Still highly fashionable, this is where "function meets fabulous", making Mia Bossi highly sought after diapaer bags. Mia Bossi Diaper Bags are sophisticated bags for any occasion. As they say, Mia Bossi are diaper bags in disguise. Oi Oi diaper bags are designed to make a statement and target the sophisticated moms. Beautiful design, vibrant colors and functional styles makes Oi Oi diaper bags popular style accessory to mothers worldwide. Oi Oi diaper bags include various different styles. 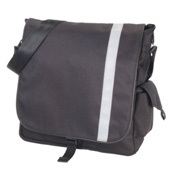 There are Oi Oi messenger diaper bags, totes, satchels, carry all, hobos, and even diaper bags suitable for men. Most Oi Oi Diaper Bags are discreet, i.e. look like any other stylish bag… meaning Oi Oi can last longer than your baby years. Storksak diaper bags are fashionable and functional. They are feminine and stylish and fit any occasion. At the same time they are highly functional, including everything you would expect and need in a high quality diaper bag. 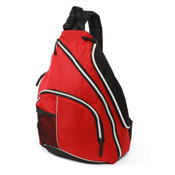 Storksak offers wide range of baby diaper bags, in different shapes and sizes. Storksak Diaper Bags are for women that want functionality without scarifying fashion. 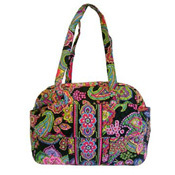 Vera Bradley is well known for vibrant colorful patterned bags and accessories. The Vera Bradley diaper bag range is no exception. Beautiful, colorful, and feminine design makes your Vera Bradley bag stand out from the crowd. The vibrant colors and patterns may not be for everyone's taste but for those that like little color in their life, they cannot go wrong with Vera Bradley Diaper Bag . And the price is pretty good for a bag that makes big personal statement like Vera Bradley. Below are few of B for Bag favorite baby diaper bags.